The Web Marketing Association is pleased to announce the call for entries for its 5th annual international MobileWebAward competition. It recognizes the individual and team achievements of Web professionals all over the world who create and maintain outstanding mobile Websites and mobile applications. The deadline for entry in the 2016 MobileWebAwards is September 30, 2016. The entry form for this award program can be found at http://www.mobile-webaward.org. The competition’s highest honor, the 2016 MobileWebAward “Best of Show,” will be given to the one best mobile website and one best mobile app that the judges believe represents the pinnacle of outstanding achievement in Web development. WSI won Best of Show Mobile Website for Lastejaam, which also was recognized as Best Family Mobile Website. Lastejaam provides an easy library of children’s TV shows and games provided by the Estonian Public Broadcasting company. FreshDirect won Best of Show Mobile Application for FreshDirect iPhone App, which also was awarded Best Food Industry Mobile Application. This app allows individuals to order groceries online today for delivery tomorrow. TopSpot Internet Marketing was named Top Interactive Agency for the 2015 MobileWebAwards competition. They received 6 awards, including: Best Small Business Mobile Website, Best Medical Mobile Website, Best Construction Mobile Website, Best Sports Mobile Website, Best Catalog Mobile Website, and an Outstanding Mobile Website Award. Judging for the 2016 MobileWebAwards will take place in October and winners are expected to be announced in late December. Judges will consist of a select group of Internet professionals who have direct experience designing and managing mobile Websites,–including members of the media, interactive creative directors, site designers, content providers and webmasters – with an in-depth understanding of the current state-of-the-art in Web site development and technology. Past WebAward judges have included top executives from leading organizations such as A&E Television Networks, Agency.com, BGT Partners, Worldwide, The Cincinnati Enquirer, Comedy Central, Disney, Euro RSCG, Ion Global, J. Walter Thompson, John Deere Company, New York Post Interactive, Organic, Inc., Refinery, R/GA, Saatchi & Saatchi, SAP, Starwood Hotels, Sun Microsystems, Warner Bros. Online, Xerox and Website Magazine. The 2016 MobileWebAwards are sponsored by the following leading organizations: Website Magazine, PR.com, Small Army Creative Services, VerticalResponse, EContent Magazine, ad:tech conferences, SEO Inc, and Cranberry Radio. The Web Marketing Association thanks these companies for their commitment to the entire online marketing community. 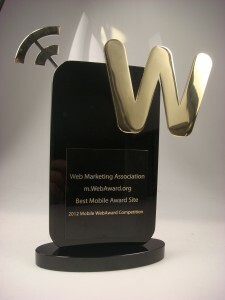 The Web Marketing Association’s 5th annual MobileWebAwards are based upon the success of its long running international WebAward Competition for Website Development and the Internet Advertising Competition. All Web Marketing Association award programs recognize the people and organizations responsible for developing the most effective online marketing programs on the Internet today. Entrants benefit from assessment of their marketing efforts by a professional judging panel and the marketing opportunities presented by being recognized as an award-winning entry.